This past week has seen me struggle mentally and having to dig deeper than usual to motivate myself to keep on making the healthier choices. For many months it seemed practically effortless to eat the right foods, to stay within my calorie allowance by choosing not to overeat, to put on my workout gear and go out running or drive for over half an hour to get to Hannah’s studio for a tough workout. I thrived with my efforts and the results that blossomed from those efforts. I marvelled at how simple and easy it was. I knew the reasons why I was forging ahead with developing a healthy lifestyle and felt strongly motivated 99% of the time. I knew that living in an obese body was a recipe for disaster, that it was only a matter of time before I died young from a massive heart attack or a stroke. I also had been diagnosed with sleep apnoea which, if untreated, brought its own serious consequences which includes higher risk of heart problems and being so overweight only exacerbated the condition. I wanted to live as long as I could for myself but also to be here as long as I can for my children. I realised that there was so much to live for. There was so much to learn and so many new experiences to have the privilege to live through. I could appreciate many occasions and moments daily to show love to myself and others and to be loved right back in return. There was an easy effortless flow between healthy behaviour and healthy gratifying results. I was flying it altogether and could powerfully motivate myself to keep going. Despite still owning the reasons above to keep on going with my healthy lifestyle campaign, I am floundering nevertheless. I seem to be all over the place this week, even though I felt I had prepared myself well for the week – writing out my exercise goals and action plan, writing out a menu and shopping accordingly and sticking up my new running plan on the kitchen door. For the first 5 days of the week I followed through with the plan, making meals and filling in my food diary and getting out to run. The only thing though was my heart wasn’t in it at all and it was a colossal endeavour to stop procrastinating, to stay on my eating plan and to get out the front door to exercise. The resistance within me was so annoying and I was irritable with myself. Even though when I got out the door and was in the zone, enjoying the challenging run, I wouldn’t be long back in the door from completing it and would be dreading the next run already, which wasn’t like me at all. I’ve just felt kind of flat and apathetic all week, feeling confused and frustrated with my lack of mojo, feeling mentally drained with trying to compel myself to motivate myself. The resistance within was mighty and I just couldn’t for the life of me seem to shake it. I had a big dreary head on me, feeling all despondent and losing touch with what was real. I was feeling sorry for myself. I was raging against what I knew to be the healthier and more vibrant lifestyle for me, perplexed to be missing terribly my old crappy life on the couch!!! Somehow I was suddenly on this negative frequency. Weirdly, I was missing the relaxed feeling of sitting watching television and petting myself with food. Even at the best of times it can be more than challenging to wrestle with my emotional overeating demons and I have have learned to nip it in the bud and distract myself with something else, keeping my eye on the prize of a healthier and more vibrant life and losing over 4 stone in the process. Lately though I don’t want to wrestle anymore and have wanted to just sit down in the middle of it and give in, feeling weary this week at what seems to have become a constant striving effort to self motivate, instead of a thriving effort. By Saturday evening I knew that I needed to cop on to myself and to stop feeling so precious. I figured a lovely new challenge was in order to help lift myself out of the miserable funk I had allowed myself to fall into. So I contacted a local running club that I have had my eye on for quite some time, Adrenaline RC, and have signed myself up!! How is that for a much needed shake-up?!! My first run with the club is tonight so I am delighted to be pushing out the limits of my comfort zone again. I am a little nervous as I am so used to running on my own, usually with a contrary head on me so I will have to rein that in while running with company! LOL! I’m a bundle of nerves at the thoughts of meeting a load of new people all at the one time but the benefits and delights of making new friends and improving my running will far outweigh any fears or nerves that may arise. This coming week I have 3 runs and one night of core/resistance work with the club and I am determined to enjoy every moment. I’m also looking forward to getting back to Hannah’s studio this week as car trouble this past week kept me close to home. I remind myself to have gratitude and to remember that there are treasures to be found in every day and in every step of the way, if I care to look for them. 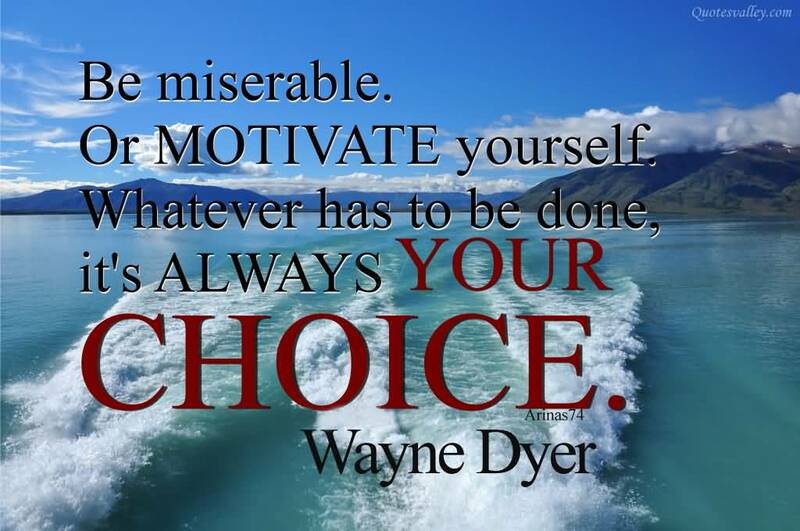 So this week, following the advice above of Wayne Dyer, I choose to stop being a miserable moan and to really motivate myself. Whatever has to be done, it is my CHOICE. 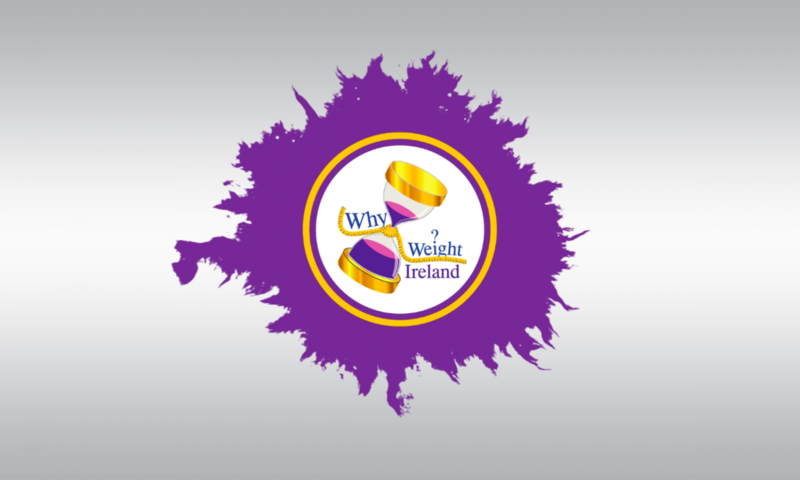 I’ve stayed the same weight on the scales this week so a total of 54lbs lost altogether. There’s a lot more work to do now to lose another 81lbs so I’m focused and determined this week to keep going. I vow not to give in to my contrary head this week with lots of new recipes to try, a great shake-up with joining a running club and my eye remaining firmly on my goal. Delicious, nutritious, low-calorie salads are back on my menu and this one is one of my favourites! Serving is for one at 260 calories. Enjoy! First plate up with the lamb’s lettuce/ruby chard leaves. Follow with the cucumber, tomato, and grated carrot. 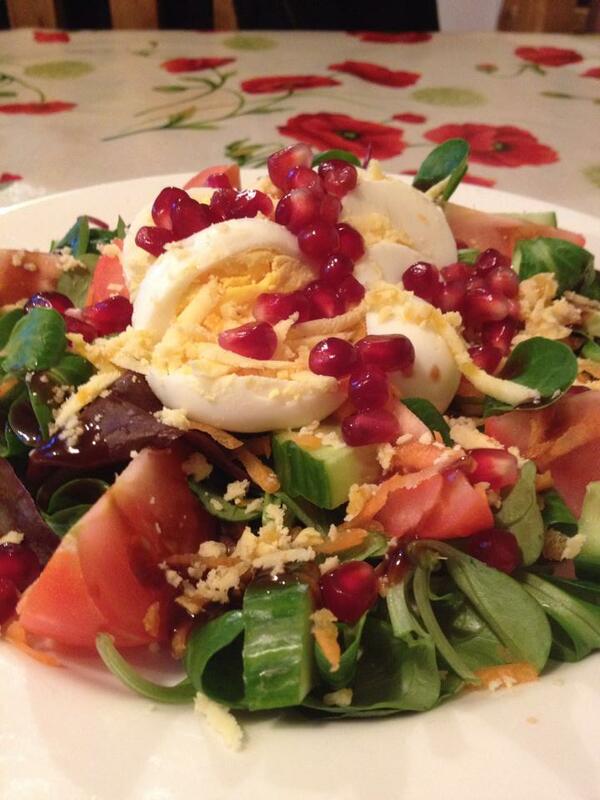 Carefully place the sliced boiled egg in the centre, topping with the pomegranate seeds and crumbled Wensleydale cheese.